University of Maine women's basketball coach Amy Vachon yells instructions to her team during the Black Bears' recent America East quarterfinal game against New Hampshire at the Cross Insurance Center in Bangor. Vachon has directed UMaine to back-to-back trips to the NCAA tournament, even though upon graduating from college she never intended to become a coach. She played for two Maine Sports Hall of Fame coaches and manned point guard, the most influential position on the basketball court. 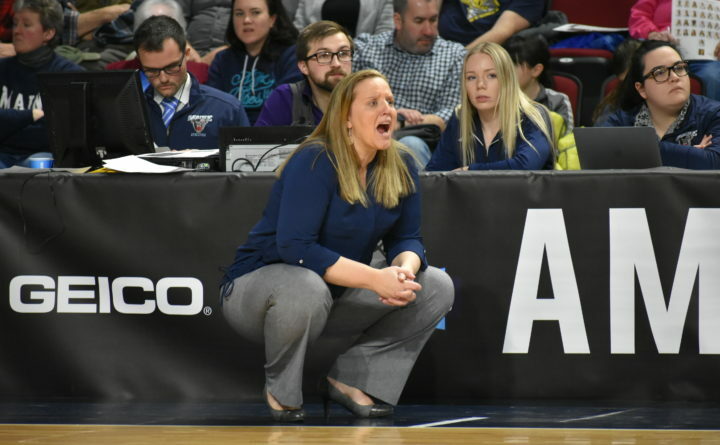 Despite that background, University of Maine women’s basketball head coach Amy Vachon had no interest in coaching after she concluded her outstanding career at UMaine in 2000. Paul Vachon had coached his daughter at Cony High School in Augusta, then Joanne Palombo McCallie, now the coach at Duke University, had her at UMaine. “She told me after her last game at Santa Barbara [California], ‘Dad, I’m all done with basketball,’” Paul Vachon said. “I think she saw the time and the effort that goes into coaching and the pressure you’re always under. She wasn’t ready at that time,” he said. UMaine had just lost to North Carolina 62-57 in the NCAA tournament. “Basketball had been a big part of my life for such a long time, and when I finished playing at Maine, I felt like I was done with it,” Amy Vachon said. She instead went into education and began a career as a guidance counselor. She started coaching as the head coach at Waterville High for one season. “I kind of fell into it by chance,” Vachon said. She worked with her dad at Cony before becoming an assistant at Greely High in Cumberland Center and then landed the head coaching job at Catherine McAuley High School in Portland. Vachon guided McAuley to the state Class A championship in 2011 and, later that year, she was hired as an assistant by new UMaine women’s basketball coach Richard Barron. “It was exciting,” said Vachon, who began her career as a full-time coach. Six years later, when Barron went on medical leave in January 2017, Vachon filled in as the head coach, going 11-7. She served as an interim head coach for the 2017-18 season, and guided UMaine to its first America East title and NCAA tournament berth since 2004. After being promoted to head coach this season, she led UMaine to a second straight regular season and tournament title and NCAA tourney berth. She has been the America East Coach of the Year for two straight seasons, leading the Black Bears to a 48-17 record. UMaine, 25-7 and winner of 14 straight, plays 26-5 North Carolina State at 1 p.m. Saturday in Raleigh, North Carolina. Paul Vachon said Amy has performed well because she understands people and knows what players go through. “As a guidance counselor, you talk to kids. That’s what you do. Coaching is teaching, so if you have a background in teaching, it helps,” said Amy Vachon, who said having been a player is beneficial. Amy Vachon was a two-time Gatorade Maine Player of the Year and was Miss Maine Basketball while at Cony. She also is the UMaine and America East career assists leader with 759. UMaine players are quick to point out Amy Vachon’s strengths as a coach, which include her level of investment in all of their pursuits. Senior Tanesha Sutton said Amy Vachon has always given her positive feedback. “She has pushed me to get better every year,” Sutton said. Amy Vachon said she focuses on the little things as she tries to become a better teacher, leader and coach. “We take things day by day. If you do it in basketball, you’ll do it in life and, generally, good things will happen,” she said. And even though she wants her players have fun as part of the process, that doesn’t mean it’s going to be easy. “I also want them to understand that it’s hard, especially if you play for us. We have really high standards,” Amy Vachon said. Amy Vachon, 40, considers herself a work in progress as a coach and admits she is learning along with her players. Amy Vachon, who credited her father and Barron for helping her become a better coach, is relishing UMaine’s second straight championship and NCAA appearance. “I’m not complaining,” she said.